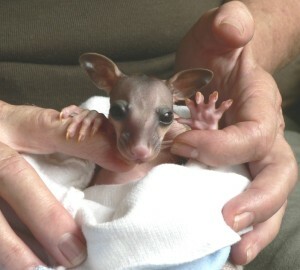 Mags goes shopping – Northern Rivers Wildlife Carers Inc.
Kmart’s website says that they make “Low prices irresistible”. They certainly had something irresistible for a young male magpie! Mr Mags entered the store on Sunday 12th of July and had no intention of leaving. He had explored all of the departments and much to the annoyance of the staff and manager, left calling cards on some of the merchandise and attempts by the staff to shoo him out were only temporarily successful, with Mags returning very quickly. Clearly he didn’t mind being there at all. I received a call from the Hotline on Monday and went out to assess the situation. The staff were helpful and very concerned for the bird’s well being. They and some concerned shoppers had offered food to the hungry bird, which was sustaining him but also allowing him to continue dropping calling cards! When I arrived mags was in the toy department up high on a sign and was starting to look weary. I had taken a small amount of mince with me and thought that I may be able to lure him down. In the past I have caught a magpie with a visible tick on his chin by luring him close and offering mince. In a small window of opportunity I was able to grab him by the tail, remove the tick and then release. This bird was not going to be as easy. Mags was hungry but still wary of his situation and the food being offered. He would not come below the top of the shelves but was interested in the mince. I placed a very small amount on the top of some shelving and he came close but not close enough to be grabbed. We needed some sort of net to throw over him but the height of the shelves made that an almost impossible task. I informed the hotline and asked whether we or WIRES might have suitable equipment but drew a blank. Tuesday the 14th we decided that we would attempt to catch the bird in the evening after 8pm when most of the shoppers had left. Cheryl put out a request for helpers and I soon had more people than we needed volunteering to help. 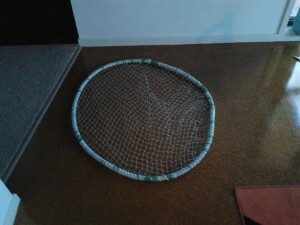 Earlier that day I made a throw-net from some fruit-tree netting, flexible electrical conduit, old building cable (to weigh down the edges) and some elastic binding. It was about the size of a large hula-hoop and was similar to some that I have seen online. I though it might be our only hope of catching him. Hayden, Richard and I went in and easily found the bird. He was looking tired and we thought he might now be an easy catch. Not so. Mags had us on a merry chase from one end of the store to the other, refusing to come down and avoiding any attempt to get close with the net. We left exhausted and despairing that the only apparent way of ever catching the bird would be to not feed it until it eventually became to weak to fly and then catch it. The problem with that scenario is that the bird would have been close to death by that stage and would need rehabilitation afterwards. Wednesday I was scheduled for a run to Currumbin Wildlife Hospital and used the opportunity to evaluate some trapping equipment at a nearby supplier. They had a very sturdily built large bird trap that would be the best way to catch the magpie. It was for sale at nearly $300. I had spoken to Cheryl about obtaining one and she had contacted committee members about it but approval to purchase was not yet forthcoming. I took a punt and bought it myself, as I couldn’t bear to see the bird suffer any longer. 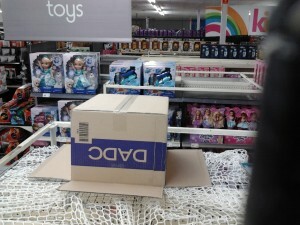 Later that night I went into Kmart and set up the trap on top of some shelving near where Mags was. He came down immediately and delicately ate the mince on the trigger-tray and flew off! I was disappointed to say the least! I tried again with the mince and when he flew down, I bumped the shelving which triggered the trap but also scared the bird and he was able to fly away. I was really annoyed as I had spent nearly $300 on a trap that didn’t catch birds! How could I expect the committee to pay for something that clearly didn’t work! Reassessing the situation I decided to reset the trap, push the mince firmly into the trigger-tray mesh and use the other trigger arm that is slightly more sensitive. Mags had flown down to the other end of the shop and with the help of the staff we cordoned off the area where the trap was to prevent it being triggered by someone bumping the shelf. I went home to await the call but none was forthcoming. – Until next morning. At 06:15 I happily received a call from the duty manager that the magpie had indeed been trapped. She had placed a cardboard box over the bird to subdue its struggles and would let me in by the service entrance. The bird was caught in the centre of the trap and was in good condition. I took it out of the trap and brought it home while I awaited the opening of the vet clinic. Mags was offered food and water but by this stage I was the enemy and he was having nothing to do with me or anything that I had. Dr. Rebecca Knee at Keen St Vet Clinic examined Mags and found a minor gapeworm infestation in his mouth and a wheeze in one lung; possibly caused by flying into something. 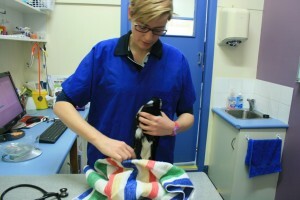 He was treated and needed to go to a bird-carer for a couple of days and have further antibiotics. Cheryl took Mags and he responded well. On Thursday he definitely wanted out of the aviary and she decided to free him. I met Cheryl in Lismore and we sought out a good release site close to Lismore Square. On the eastern side I saw a magpie clan but the western side appeared to be a better site. We joked that no matter what side we chose it would probably be wrong but the western side was clear of traffic. Mags was keen to get out of his carry-box and took his bearings for a while before flying strongly away… right into another clan’s territory where he was instantly chased off. He sought solace to the north of the shopping centre happily being free again. Everyone involved in his rescue deserves special thanks. Richard and Hayden for assisting, Cheryl for her care and the Kmart team especially for caring about the bird despite the damage he did to their merchandise. I am told that on one day they had to throw out $300 worth of damaged stock! As always the Keen St Vets for their professional treatments and the NRWC committee that decided not only to buy the trap but to get another for the injured bush turkeys that are hard to catch.